In the science of astrophysics, a black hole is a hypothetical region of gravitation from which matter and energy are unable to escape. They are called black because no light can escape from them which makes them optically black. They are called holes because the theoretical geometry which describes them results in a coordinate of infinitely small dimensions called a singularity, where everything is compacted down into nothing. In a mathematical sense, black holes are the bottomless pits of the cosmos. 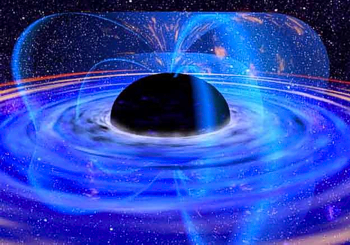 Most scientists today are convinced from the circumstantial evidence that black holes exist. However, they are not generally believed to be exactly like the singularities suggested by their mathematical models. This is mainly because black holes have mass, something that they should not possess if all their matter had actually been compacted down into nothing.